I have tried so many face products it is crazy and nothing seems to help with fine lines, spots, dullness and acne, until now! I have finally found a line that I love! I use to use spa quality facial care products, but I found that they made me break out or not really do what they claimed to do. Then I switched to med spa grade products, and I saw more significant results but a lot of them were too strong for my sensitive skin. I came across SkinMedica at a med spa and looked it up online at home. They have a wide variety of products but after reading numerous reviews it seemed like the total regeneration system was the best bet to really combat all the issues listed above. The system is made up of three parts. 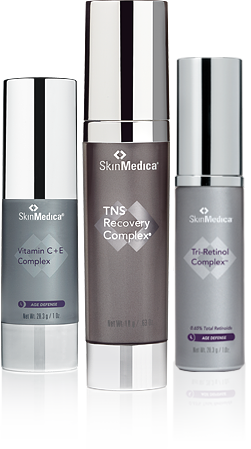 The first that you use in the morning, and night is called TNS Recovery Complex it is a gel-like product that fights fine lines, texture, sun damage and improves skin tone. It is made with a patented growth factor blend according to the site. The texture is gel like; it is a red in color but leaves no color on your skin and although some people on the reviews say it smells funky it really doesn’t bother me at all. The next part you only use in the morning after you put on the Recovery Complex and this step is the Vitamin C + E Complex. This step helps to fight free radicals and improves the tone and texture of your skin. My favorite part is that it makes my skin so silky smooth I have actually just used this instead of a primer. The texture smoothes my skin, makes it glow (with no shine) and reality helps me from being oily all day! Finally, at night after you use the Recovery Complex you put on the Tri-Retinol Complex which has three forms of vitamin A, which really helps with fine lines by exfoliating and rejuvenating the skin while you sleep! The only con of this series is the price; it’s up there, but you do get three full-sized bottles. In addition, I found it on Amazon and managed to save $90. I will say I have tried products that cost less and even some that cost a bit more but nothing compares to the overall results of this system.